This week’s GoodEReader.com Ebook of the Week author is Russell Blake, whose interview took place from his home on the Pacific coast in Mexico, where he has lived for several years. “I’ve been writing for several decades, but decided this year to do so via self-publishing, for the broad market,” says Blake. “Up until then I didn’t feel the quality of the work was at a level I could be proud of, and because I’m not really doing it for revenue, it was more important for me to focus on honing my craft than on putting books out. I had ghost written several non-fiction tomes which were well received, so I decided this year, given the new wave of enthusiasm over reading brought about by eReaders, to embark on a course as a self-published author. 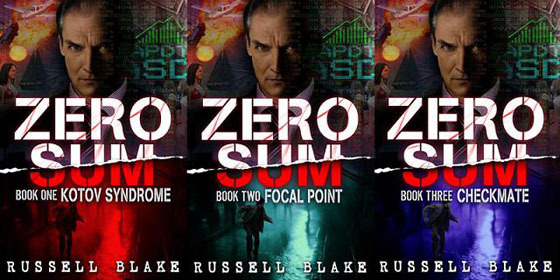 “My latest is a trilogy of Wall Street thrillers: the Zero Sum trilogy. Kotov Syndrome, Focal Point and Checkmate. They’re a serial, and are titled after chess terms, as the plot is very much akin to a civilized chess game between a Wall Street financial marauder and an investor who becomes embroiled in the market predator’s scheme, which quickly turns deadly. It’s topical, especially in light of the current outrage over a market system that’s completely out of control, and which favors criminality and pecuniary interests at the direct expense of the rest of the country. To receive your free copy of Book One of the Zero Sum trilogy, Kotov Syndrome, click here. Thanks so much for featuring Zero Sum as your eBook of the week. It’s a pedal to the floor set of thrillers that have gotten raves since they were just released a few weeks ago. I hope your readers enjoy the experience as much as I did doing the interview. Thanks again.